Synopsis: The life of a successful sculptor is turned upside down when he begins receiving mysterious messages from someone who asks for his help. My Quick Review: My first Anwar’s movie experience was recently with Modus Anomali, a very intense Thriller with a twist. I was already seduced. But this Lynchian experience that is The Forbidden Door has cemented my initial feelings. With Pintu Terlarang, Joko Anwar definitively proves indeed, that he is a master storyteller and cinematographer and a director/writer to keep following in years to come. 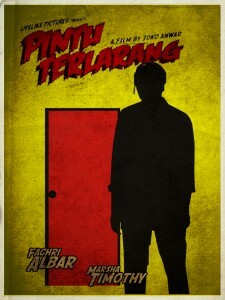 The movie’s visual clues, the shocking bursts of violence (some child abuse scenes are especially hard to stomach) and the excellent acting across the board (special mention to Fachry Albar in the main role) all add to the eeriness of Pintu Terlarang and will keep you guessing till the end. The Forbidden Door is a movie that truly deserves multiple viewings to be better appreciated and understood. It is far from being perfect (some plot points drag a bit too long and the editing has a few problems as well) but I, for one, cant wait to see what’s next for Joko Anwar.